On Thursday, February 4th, 2010, members of The Foundation for Sacred Arts had the privilege of meeting and presenting a gift to a notable hero in the culture wars, His Most Illustrious and Reverend Eminence, Christoph Cardinal von Schönborn, Archbishop of Vienna. His Eminence, a Dominican Father and a modern-day "Thomas Aquinas," was the principal editor of the Catechism of the Catholic Church. A prolific author, his publications include God’s Human Face: The Christ Icon, which investigates the theological foundations of iconography. His Eminence was in Washington, DC to celebrate Mass at the Cathedral of St. Matthew and then to speak in his office as the Grand Chancellor of the International Theological Institute at a dinner hosted at the Army and Navy Club, a prestigious "members only" club located at Farragut Square. Many notable ITI graduates, scholars, staff and theologians attended this event. We were most fortunate to meet with His Eminence twice that evening -- briefly at the Cathedral after Mass, and later to make this Rosary presentation to him at the reception prior to dinner. On both occasions, he received us with great enthusiasm, interest and warmth. It was quite an experience, facilitated by our friend and supporter, John Henry Crosby, Founder of the Dietrich von Hildebrand Legacy Project, who is also an Advisory Board member to the Foundation. Our gift to His Eminence was a traditional Dominican Rosary hand-crafted by Mary A.D. Petrino, a member of our Board of Directors. The Rosary, which includes the heavily-indulgenced Sterling silver "Pardon Crucifix" designed by Pope St. Pius X, features "Ave" beads of red flake jasper and snowflake obsidian beads, symbolizing his position as a prince of Holy Mother Church and as a member of the Order of Preachers. The first three "Ave" beads are rendered in lapis lazuli, bloodstone and red flake jasper, signifying the three theological virtues of Faith, Hope and Charity. The "Paters" are handmade Sterling beads, designed to resemble the bishop's mitre; and the Sterling "Scapular" center medal features a carved image of the Sacred Heart of Jesus, with an image of Our Lady of Mount Carmel embossed on the reverse. Finally, the box illustrates the two great apostles, Saints Peter and Paul, appropriate to the office of the Cardinal. Top image, left to right: Ann Marra, Executive Director; His Eminence Cardinal Schönborn; Mary Petrino, Board of Directors; Rachel Ross, Curator of Art. 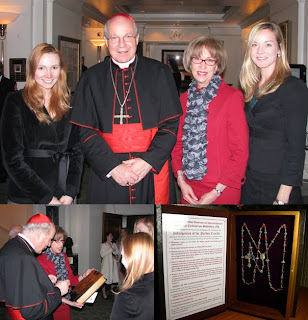 Bottom left: Foundation Member Mary Petrino presents the hand-crafted Rosary to Cardinal Schönborn. Bottom right: The hand-crafted Rosary presented to His Eminence.